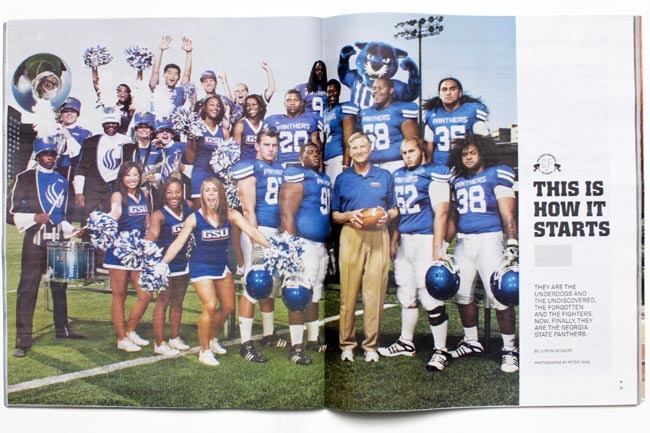 Just after popping up on the cover of Atlanta Magazine, the Georgia State football team continues its press blitzkrieg as the season opener edges ever closer. 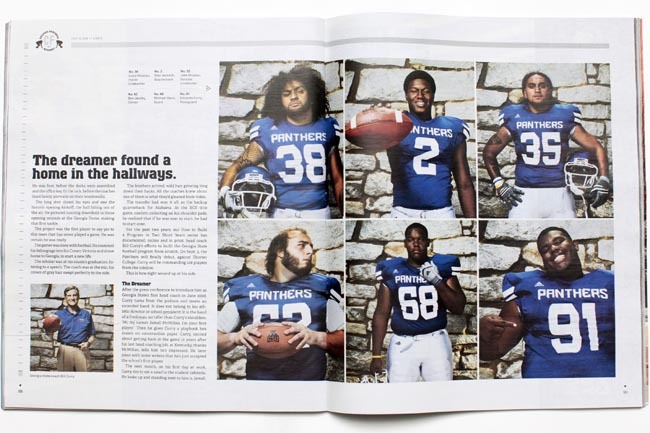 This week you can find them on the cover of ESPN the Magazine’s football issue, with an inside article on the program’s formation and inaugural season. Pictures were shot by former Texan and current New Yorker Peter Yang, who seems to have a little love affair with Atlanta seeing as how much he stops by. The cover itself was actually shot by Nathaniel Welch, most likely not in Atlanta, but hey, it’s nice to get some recognition, especially for a small program. For any Panther fans or alums (I’m looking at you, Chris Carder!) the season kicks off on Sept. 2nd against Shorter University at the Georgia Dome. Picture Man from Terminus Films on Vimeo. 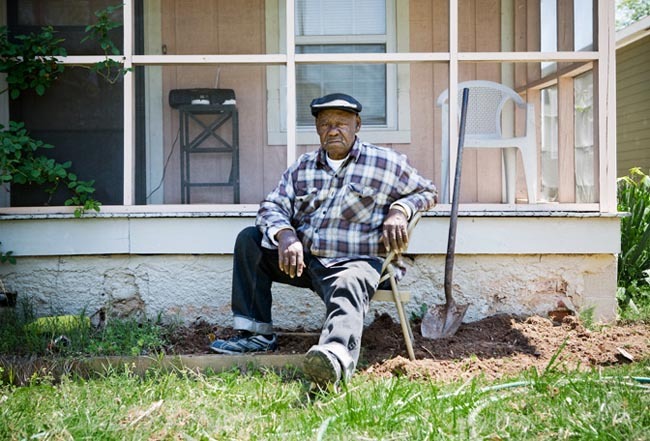 Atlanta legend Oraien Catledge will be at Lumière on Thursday evening from 6 – 7:30pm signing his book, Oraien Catledge: Photographs. If you’re not familiar with his work, take a look at the video above and see how the Mississippi transplant became Cabbagetown’s “Picture Man”. Any good photographer worth their salt will always tell you that they are working on a personal project at any given time. 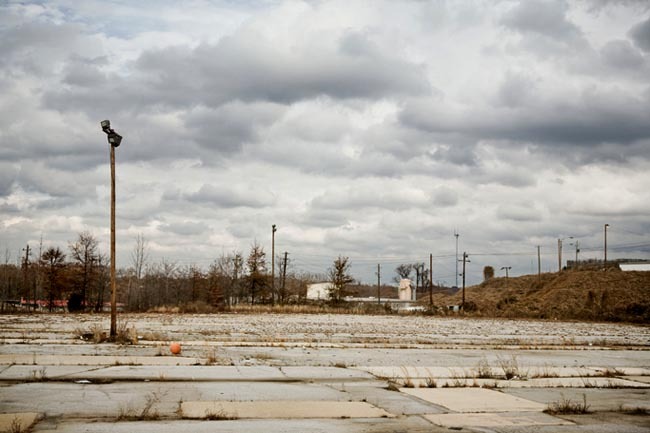 Chris Martin knows this city well and his recent images of the Atlanta BeltLine show the divide between sprawl and decay. He was kind enough to provide a little background into the two year project. 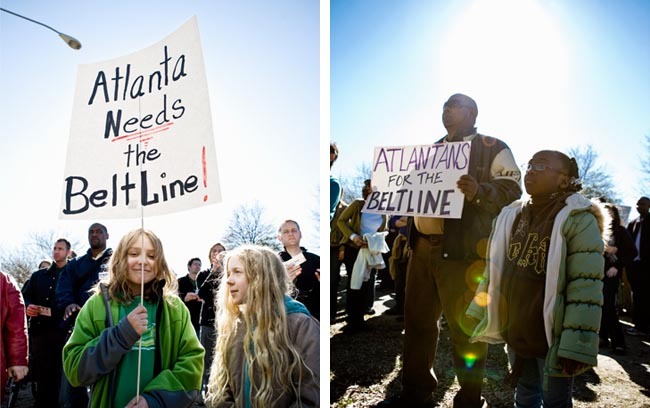 First off, give us a little bit about The Atlanta BeltLine. This is basically a rails to trails project. It’s a 22 mile loop of mostly unused early 1900′s rail lines that loop the city. Clearing these lines of debris and the former rails will provide a connection between neighborhoods throughout Atlanta. Walking trails are already in place in parts of the city, but the long term plans call for a light rail system. I originally was hired for an editorial project photographing the two CEOs behind the project and a few of the neighborhoods it passes through. I didn’t know much about it at that time. This was in the end of 2007. 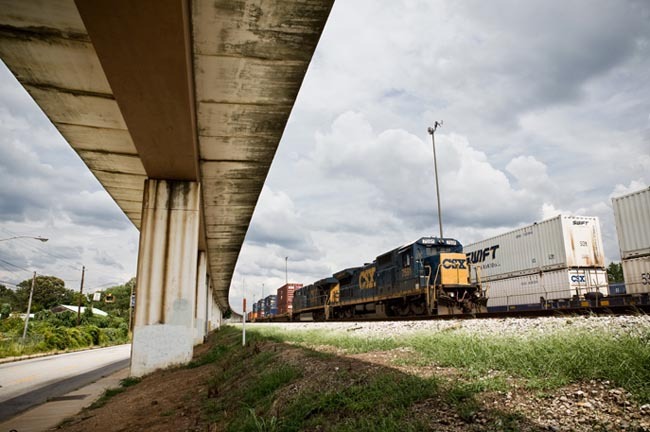 How much time have you spent photographing The BeltLine? I’ve been shooting for the project since March 2008. It started out with trying to capture the areas in town that were already slated for construction. My first day of shooting was along White Street, near Rose Circle Park/ This is considered mile one of the Atlanta BeltLine. I shoot every month for the BeltLine and most recently it has become almost weekly. There is so much to cover and I get a bit mad when I see someone else’s photos of something I might have missed. There are parts of The BeltLine that pass through some rough parts of town. How do you approach these places when taking pictures? I just go out and shoot. I am aware I stand out as an outsider in a lot of neighborhoods. I pay attention to my surroundings. I have always ventured off the beaten path for photos and I enjoy exploring. I’ve never had a problem and have met a ton of people. What kind of equipment are you using? Would you consider any other cameras/formats or are you set on your tools for this project? It’s me, my 5D, and a 24-70 lens. I keep my kit light because I never know when I will have to climb a fence, or down a steep embankment. I have lugged strobes out with me for specific shots. I am open to other gear, but for now, this works. The whole loops runs over 22 miles. Do you have a spot that seems more photogenic than others? I asked a friend that same question and got a full page response. The loop is so diverse its crazy, especially as things have started to develop. The quarry in the northeast is incredible. I was allowed down into it and it was spectacular. Any spot you get a different view of the skyline is nice. In the southeast you can climb on top of an abandoned building to overlook a park under construction and the city looms in the distance. They are so many wooded areas that people don’t venture in too, right inside the city. I spend a lot of the time out on the BeltLine by myself and it is really quite peaceful and beautiful. How about some of the people you’ve met. Have any of them told you stories of The BeltLine? It’s amazing how many people have no clue what the BeltLine is. Even if they live five feet from it. This goes for people in every part of town. Some of the stories I have heard are about some of the buildings that have gone derelict. Older folks are great to hear stories of what used to be there. Have you encountered any obstacles getting access to some of the locations? Not really. Fences have holes. Most of the areas that are blocked off are abandoned. Or I just knock on the door and ask for permission to go where I need. I surprisingly have only been stopped by the cops twice. The first time was an over-anxious Dept. of Public Safety officer spouting off lines about Homeland Security and photographing bridges and highways. The other was a cop new to the area. I had a nice chat with him on the bridge over Ponce. It’s nice to know my record is clean(ish). What’s the reception been so far from the pictures? People love the pics. It helps show people that this is happening. It also is a glimpse into places they don’t know how to get to or haven’t been. They have been used by various government agencies, some of the partner agencies and a few magazines. I am planning an exhibit, just working out the details. But, so many people don’t know about this project. Get out there. Walk the trail. See where it intersects your neighborhood. Get involved so you can say “You were there when…” All the cool kids are doing it. The BeltLine is happening! To see more photos from The BeltLine, check out Martin’s website. 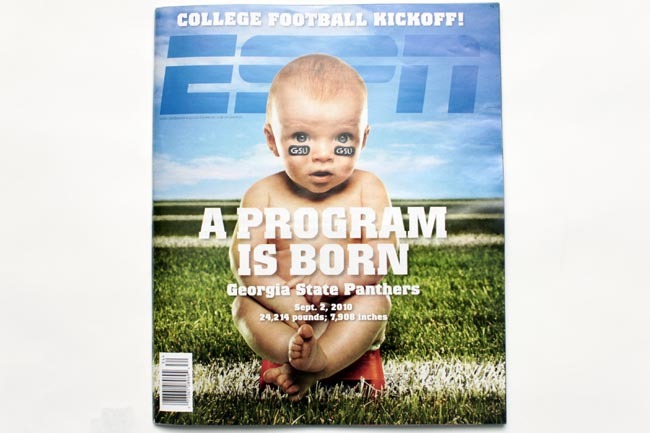 He also has some nice frames in this month’s Atlanta Magazine issue about football.